I Quit My Job . . . Now What? 170 I Quit My Job . . . Now What? I can't believe it. I quit my job. I'm no longer an employee. My financial well-being is 100% dependent on what I do. It's kinda crazy if you ask me . . . and . . . I'm Excited. If you've been following me for a while, you know that being a university professor was my dream job. However, due to recent events, I've come to realize that I needed to make a change. 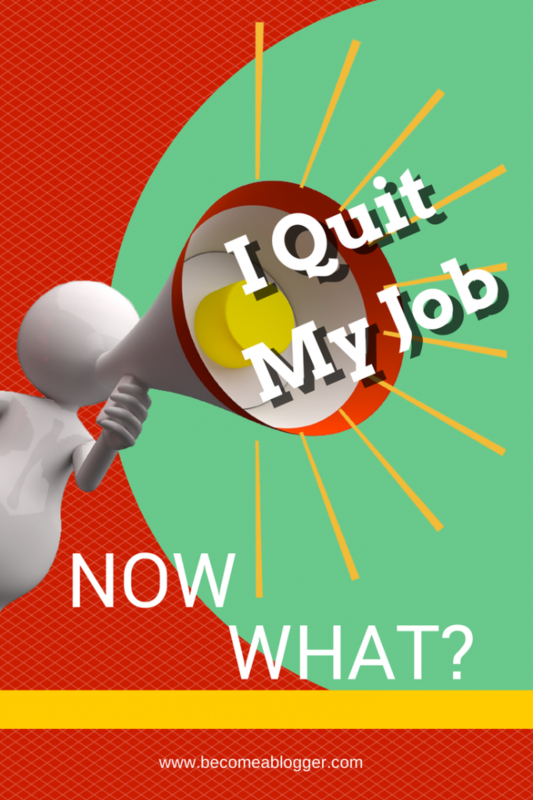 The biggest thing that changed is that I decided to leave the job that I love. Click here to download transcript. 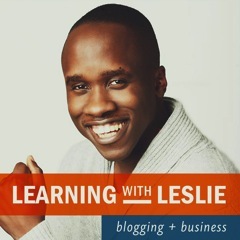 Learning With Leslie is a podcast dedicated to helping you build a business around a blog. No, not one of those blogs that will fall by the wayside when Google has a mood swing, but one that will thrive no matter what gets thrown at it. I share tips and strategies that I’ve learnt building blogs since 2008 and interview experts who are knowledgable about various aspects of blogging so that we can learn from their experiences. If you’re a blogger, thinking about becoming a blogger (pun intended) or are not even sure if blogging is right for you, go ahead and tune in to see what this blogging thing is all about. Leslie I am very impressed with your work & have a proposition that I would like to discuss with you more in depth. Thanks Brett. I appreciate it. What kind of proposition would you like to discuss? Thank you for a truly inspirational podcast. The song is great you should end each podcast with it. How can I get on your list of beta tester for your new program? I don’t have my blog running yet, so it would be a great help to have this training to get my blog off and running on the right track. Again thank you for everything you do. Thanks Jim. Yes, it’s all about helping others on your way up. Glad to hear that you are finding value in the content. Excellent story I have to say I’m learning a ton from you in more than one way my wife and I are expecting our first in September and as my audience grows I can’t help but think about many of the situations you’ve shared over the years. I’ve been blogging full time for a while now so I’ll say to you welcome and much success peace. Awesomeness Darnell. Glad to see others who are out there doing it. Wishing you all the best with your first. It’s gonna be a challenge you’re gonna love. Leslie you have inspired me. Your presentation was affirmative to me. Just yesterday I decided to create all my responses for videos, blogs, forum posts, and lessons that I will be using to teach an online class in a few days. When I heard you say that this one thing you will do to make things easier, I felt affirmed and excited too. Awesomeness Elvetha. Glad to hear that something I say can be affirming and exciting to others. Keep on keeping on. Leslie, First off, I have to say you are adorable (old ladies get to say these things). Your enthusiasm, honesty, eagerness to give your best all shine through. I’m “in” if you’ll have me in your beta testing. I need your help and I’m ready to move forward. Awww, I’m adorable 😉 I love it. Thank you so much Linda. I’ll be sending out an email as soon as I launch it. It’s definitely a challenge to find that spare time when you’re working full time. The key thing is focus. Figure out what it is you should be focusing on and focus on that one thing. Then, as things grow, you can see where to go next. In terms of the university, I will be sending out an email about it next Tuesday, so stay tuned and act quickly because I’m definitely capping it at 20 to make sure that I can focus on those individuals. Congrats on the commitment, Leslie. I also admire the bravery in making your commitments so public. Best of luck as you continue to go up! Thanks for all you do to change the world. This is all so exciting!! I’m so happy to hear about all the changes coming up for you and Become a Blogger. Definitely moving upwards! In the last few months, I have thought about what that one thing is that is getting in the way of me living my life. It is my job. I spend 40 hours a week depressed and in a dark place, only to come home exhausted and have a hard time finding enough time to really chip away at my blogging business. My 9-5 completely drains me and is just leading to more and more unhappiness. I wish there was a way I could just jump ship and take a leap of faith, but I’m at the point that it’s still too risky to make that jump. Hopefully in the next year, that will be a reality. Just gotta keep plugging away. Thank you Leslie for your inspiration. YES! Every moment is a “fresh start”, a new opportunity to live in closer alignment with our deepest values and our heart’s desires. Thank you Leslie for your willingness to share your process of doing just that and offering tips, teaching, and tools for “Changing the World, One Blog at a Time”. With your mentoring, I intend to be soaring free too….and ASAP! You are very much welcome Laura. You can definitely do it. Takes hard, strategic work, but it’s so possible. Leslie, congrats on having the tenacity to follow your dream, you’re a great example to all of us as to the meticulous planning! as well as courage it takes. I’m a recent follower of your podcasts after having discovered the Become a Blogger videos. Your example and ongoing instruction has helped me (finally) start my own blog, which also has the goal of helping others achieve their potential. As a former medical professor myself, I really appreciate your teaching style. And if fortunate enough to be accepted as a “Charter Member” of BBU look fwd to both learning and contributing! Thanks for the encouragement Roger. I’ll be sending out an email by Tuesday about the University, so stay tuned. I will be most appreciative for your advice on the 16th. I don’t think I mentioned that I’ve experimented before with posting webinars on my unlisted YouTube account. Just don’t know how to link everything together for controlled accessibility. Leslie, I’m excited for you as you embark on this next journey in your life. I’m also excited about your vision to help those of us who are trying to find the formula to becoming successful online bloggers or marketers. I can’t wait to see what you have install for BAM. Much success to you my friend. I appreciate the support and encouragement Donovan. relationship with other bloggers as well as get exposure for our blogs as well. Become a Blogger Insider and get my 2018 Blog Content Calendar Spreadsheet! Copyright 2017 by Become A Blogger. WordPress Theme from ThriveThemes.